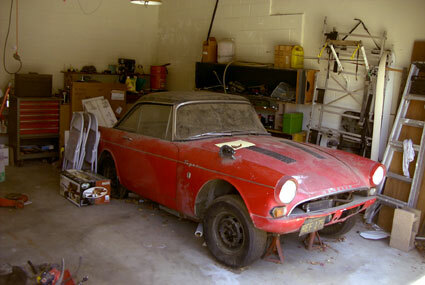 My name is Robert Seghi and I recently purchased a 1965 Sunbeam Tiger MK I from a friend from a long time ago. You see, I was 16 years old in Southern California, (Woodland Hills), and driving my first car (a 1967 GTO) when I made a neighborhood friend who was much older than I.
Chuck was his name, and he was a drag racer from long ago, and drove a ' 65 Sunbeam Tiger. He used to help me get my car tuned up and we would talk about cars for hours. I grew up and joined the ARMY, moved away and that was that. Hadn't seen Chuck since. I had always wondered what happened to that Tiger. Well, fast forward to 20 years later. I'm driving through the old neighborhood and remembering. When I passed my Chuck's old house, what was in the garage? That same old Tiger, still red and looking a lot older. I knocked on the door and Chuck answered , WIDE EYED. Like he'd seen a ghost. We talked for awhile and of course, I had to ask what was he to do with the Tiger. He said he was thinking about selling it. Of course I stepped up to the plate and asked if I could have the chance to restore it. To my delight he said yes. I agreed to his price ( I won't tell you how much, grin ) and brought it home, to find out that it is very complete and so very RUST - FREE. He said it had sat for 15 years. It was untouched, unmodified, and unmolested by uneducated hands. It even had a hard and soft top, and it had the GT cover for the soft top. 15 years, parked. A jewel hidden in a cave! I look forward to restoring this one with a few updates like 4 wheel disc brakes, a 5 speed, and a 302 CID - just to make it more fun, but NO HACKS. When I bought this car I had no idea about the history, the uniqueness of this breed. I just paid the price 'cause I knew it was something special. Oh b.t.w. I paid more then any used car I have ever bought. My past restorations: '67 GTO, '66 Biscayne Big Block 4spd, '69 BelAir, and a bunch of my dads English cars. I'll never understand Whitworth sizes and the purpose they served. Fortunately, the Tiger uses the same threads as in the US. I intend to keep records and notes on my restoration. Take pictures as it progresses. Who knows? Maybe there is an article worth publishing in there.